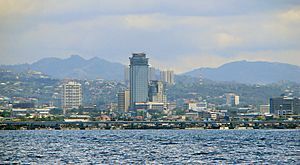 Cebu is the oldest city in the Philippines. It is often called the "Queen City of the South." Cebu is a main center of Christianity in the Philippines. The city has a lot of interesting history. 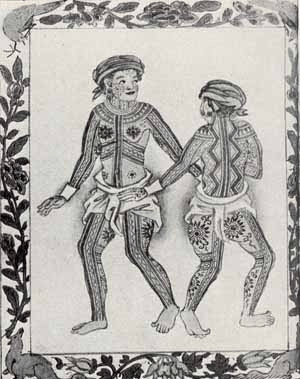 Cebu was a fishing village and busy trading port in 1521. The center of the city has become modern and is well developed. Cebu has nine cities: Cebu, Bogo, Carcar, Danao, Lapu-Lapu, Mandaue, Naga, Talisay, and Toledo. There are also 44 smaller towns. 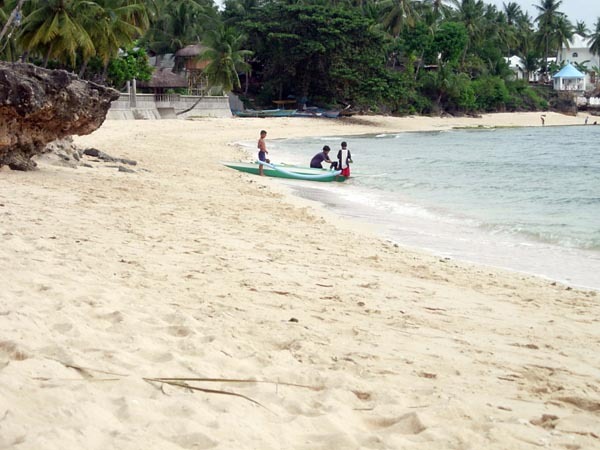 Cebu has recently become the favorite tourist spot of the country. Language Cebuano is the native language. English is also understood. Some people who emigrated from other parts of Visayas or Mindanao speak other Visayan languages. Weather December - May: Dry; December - February: coolest; March - May: hottest. The temperature can rise higher than 100 °F in the summer. The rainy season begins in July, bringing heavy rains. Currency pesos, divided into 100 centavos. Devotees inside the Basilica del Santo Niño. Cebu Province Facts for Kids. Kiddle Encyclopedia.